THE LATEST IN EPSON'S DTG OFFERING, DON'T MISS OUT ON THIS GREAT OPPORTUNITY! When the SureColor Fabric series was first launched it represented a revolution in textile printing. The equipment was designed from the ground up to provide a complete single-vendor solution with superior imaging and simpler operation. 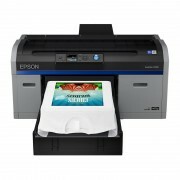 The F2160 is Epson's latest generation Direct To Garment (DTG) printer. It is designed to output directly onto cotton based material including shirts, caps, bags and promotional items. Prints can be made on pre-cut pieces or directly to finished garments with a heat press subsequently used to 'fix' the dye. The printer features enhanced imaging for superior quality and faster operation for improved productivity. It can be configured for high speed colour output on light fabrics or white + colour output on dark fabrics. Reliability has been enhanced and white ink management has been improved for a lower running cost. It is backed with a comprehensive warranty complete with on-site service cover that can be extended up to three years. The SC-F2160 uses advanced Epson Ultrachrome DG ink and our latest PrecisionCore print head technology. The print head supports resolution of up to 1440 x 1440 dpi for exceptional precision and consistency. Enhanced imaging and positional adjustment has enabled improved print quality. Ink consumption has been reduced and density is adjustable to enable variable levels of quality and finish. Enhanced productivity: Faster frameless loading and an improved print speed. Designed to produce a t-shirt in 15 seconds when configured for high speed colour and 52 seconds when configured for white plus colour. Enhanced print quality: Finer height adjustment for improved ink application and upgraed Variable Size Dot Techlology for superior imaging with reduced grain, an enhanced colour gamut and smoother gradation. Enhanced functionality: Supplied complete with imaging software. New features enable more flexible editing and arrangement, addition of customised text, and presentation/finish adjustment. Enhanced reliability: Upgraded head design and improved ink management system. Backed with a comprehensive 'Heads-N-All' on-site warranty with cover extendable up to three years. Reduced operational cost: Reduced ink consumption and new Self-Washing Capping System with dedicated cleaning cartridge for simpler operation and reduced maintenance. Outstanding flexibility: Supports fabric up to 25mm thick with platen options to support a wide variety of applications. Ships in a choice of two configurations; High Speed 4-colour for work with light coloured fabrics or 4-colour with additional White ink to suit light and dark coloured fabrics. Easy to install and operate: Simple set-up with a small footprint and all-front-loaded consumables. Features auto height sensing and a large colour LCD control panel with in-built help and improved thumbnail viewer. Extended warranty available. Please ask for details.